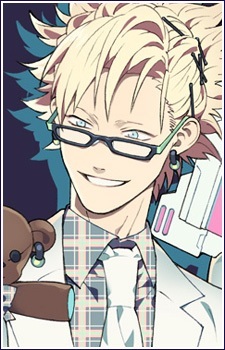 Virus is one of the supporting characters in DRAMAtical Murder. Although Virus may resemble Trip a lot, they are not actually twins. Virus' hair is pale blonde, spiked up at the back with his bangs on the right. His eyes are bright blue and he wears a pair of glasses, which are black with green arms. As accessories, he wears a pair of earrings that match the ones Trip wears. His tie is checkered to compliment Trips' clothes, and he wears a fitted black suit, as well as white shoes. Additionally, he wears a Morphine pin on his suit. Back when Virus was young, he wore oval shape framed glasses and his hair was less spiky. Virus also revealed that his eye color changed after both he and Trip were tampered with, so they would not not be affected by Sei's abilities. Virus and Trip remained as Aoba's friends. They sometimes bump into him in the Old Resident District and show their interest in him. Later on, they appear to help Aoba and Koujaku escape from the police from Dry Juice's hideout. Virus is also the one who calls Aoba, informing him about Akushima's plan to imprison the latter. He later reveals that they are a part of Morphine and are working on behalf of Toue. Aoba, on the verge of defeat, is saved by Koujaku, Noiz, Mink and Clear. Afterwards, Virus and Trip disappear without a trace. Virus' ending is connected to Ren's ending. It is unlocked after completing the main four (Noiz, Koujaku, Mink and Clear). While wandering through what seems to be a research laboratory inside Oval Tower, Aoba enters a room where he suddenly hears a voice - the same voice from his dream once. Suddenly, he is faced by several other people, which turn out to be members of Morphine, together with Virus and Trip. After revealing the truth about their connection to Morphine, Virus orders the team to beat Aoba up just enough to keep him alive. The latter resists and tries using his power, Scrap, on them, but ultimately fails as Virus and Trip have already prepared for that to happen. No longer able to fight back, Aoba lies unconscious and wonders if this will be the end for him. After a while, he awakes in an unfamiliar room, on a bed with Trip gently caressing him. Virus explains that they intend to keep Aoba for themselves instead of handing him over to Toue, since they dearly love him. Much to Aoba's anger, he is again knocked unconscious. Six months pass, with Aoba still being held as personal slave, seemingly with a completely broken mind, leaving him in a submissive state. Virus expresses his joy when Aoba is submitting to their touch and does not resist. They believe that they do not need any more chains or collars for Aoba unlike before, where he usually struggled and fought back to regain his freedom. The two of them then proceed to use his body to sate their lust. At the end of the scene, Aoba desperately cries as he again starts to wonder when can he will be able to leave this place.